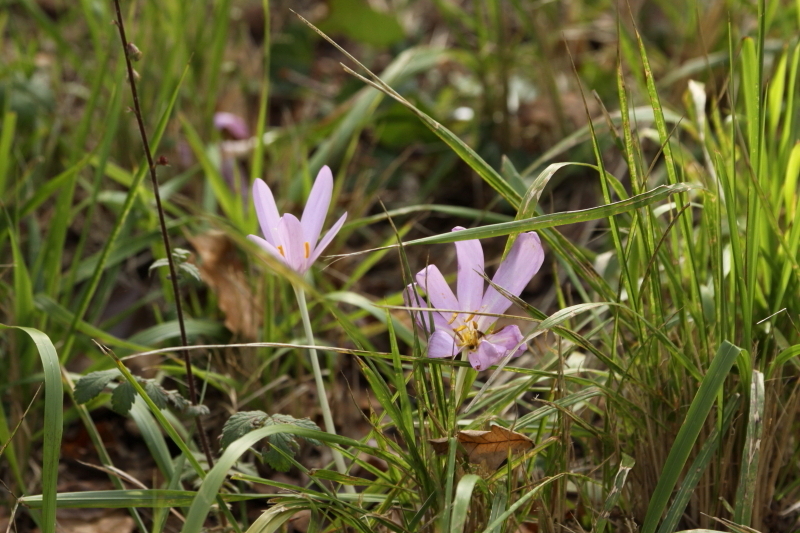 Meadow saffron also known as Autumn crocus is one of the few woodland flowers which comes into bloom in the Autumn. The other is the wild cyclamen or sowbread which is the subject of another article. Meadow Saffron flowers are more delicate than most of the Spring flowering Crocuses and only come in one colour, purple. It is in fact unrelated to the normal garden types of crocus. 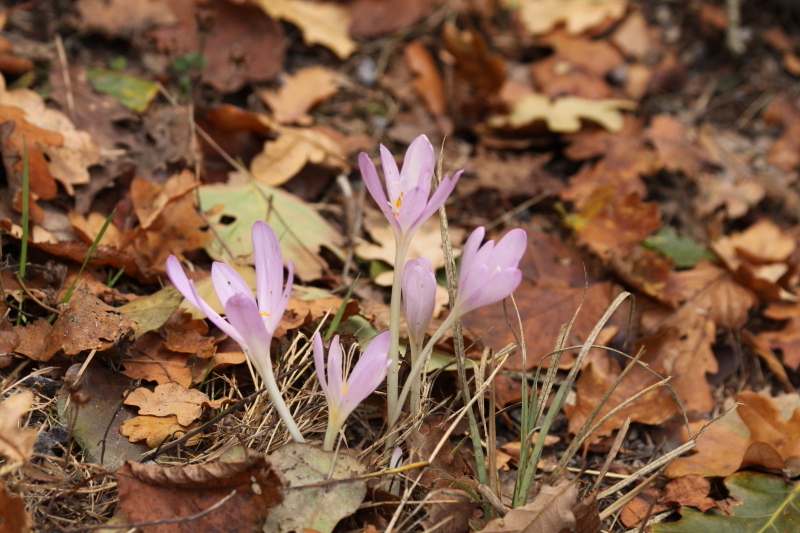 There is another species which is a true crocus that does flower in the Autumn and this is also called Autumn crocus. The difference is that the flowers of Meadow saffron have a white stigma, you can see it in the photo above and true crocuses have a yellow stigma (used for the spice saffron) How confusing? 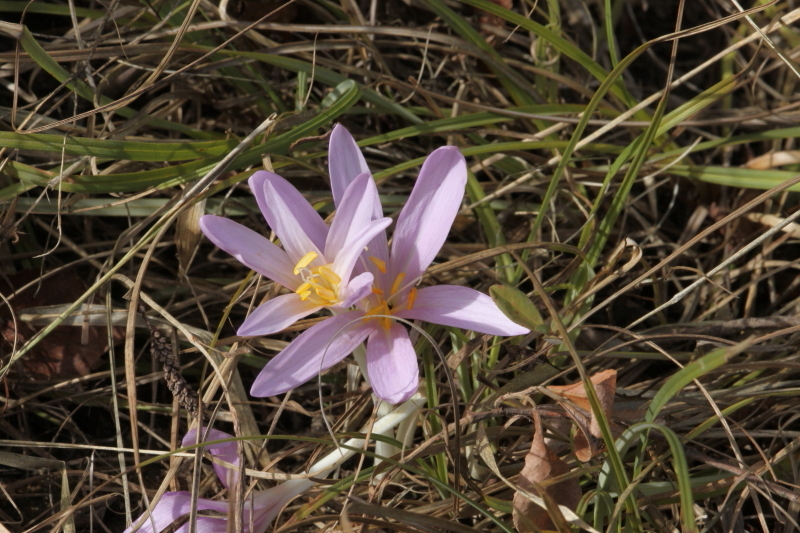 Also Meadow saffron has 6 stamens and the crocuses only have 3. The flowers emerge after the leaves have died back, this gives rise to an alternative name which is Naked ladies… that should induce a few extra hits to this article, if I add the tag ‘naked ladies’ there will be some disappointed folks but they may learn something. Colchicum is quite poisonous, and has resulted in some fatalities when people have collected the leaves, mistaking them for the leaves of Ramsons which are edible and have a garlic taste. Throughout the ages extracts from colchicum have been used as a way of warding off gout, and you can now buy preparations of Colchicine to prevent the recurrence of gout. Colchicum is also used as the source of a very important chemical in the plant breeding field. This can be used to induce plants to double their chromosome number. Why is this important? well if you artificially produce a hybrid between two related plants, then it will normally be sterile because the chromosomes from one parent will not match up with those of the other parent. Possibly different numbers or maybe different sizes. So the only way to propagate this new hybrid plant was by asexual means…cuttings or via tubers, bulbs etc. Slow and not always easy. Then along comes Colchicine, this chemical inhibits the process of meiosis which is the way plants and animals produce haploid gametes form normal diploid cells. So you end up with gametes (pollen and ovules)that are diploid not haploid. Then when they meet up and fertilise each other the new seeds will have cells that have a complete diploid set of chromosomes from one parent and a complete diploid set from the other parent. This makes the new plant a tetraploid and it means it will now be able to match up chromosomes and will now be fertile. Thus a new fertile hybrid is produced. This treatment has been used on many species including Cannabis, Gingers and Zinnias. As with so many plants this species has declined in recent years. Partly this is because landowners that farm with sheep and cattle have removed it because it is also poisonous to livestock. The heartland for the species is around the Wye valley, particularly to the east and west ie into the Cotswolds and some of the Welsh hills. You are not so likely to find it actually in the Wye valley. Having said that garden escapes are possible anywhere in the country. 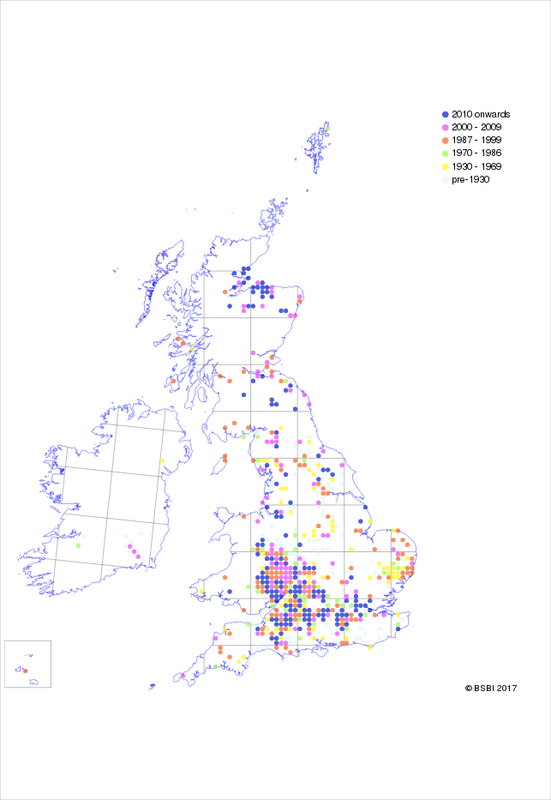 Here is a distribution map from the BSBI. The photos at the start of this article are of plants growing in France, recently I came across quite a few growing in woods near Staunton in Gloucestershire this is very close to the Wye valley. These plants were much more spindly than there French relatives, most of them were not upright they had flopped over, looking quite bedragled. Here are a few photos of them.